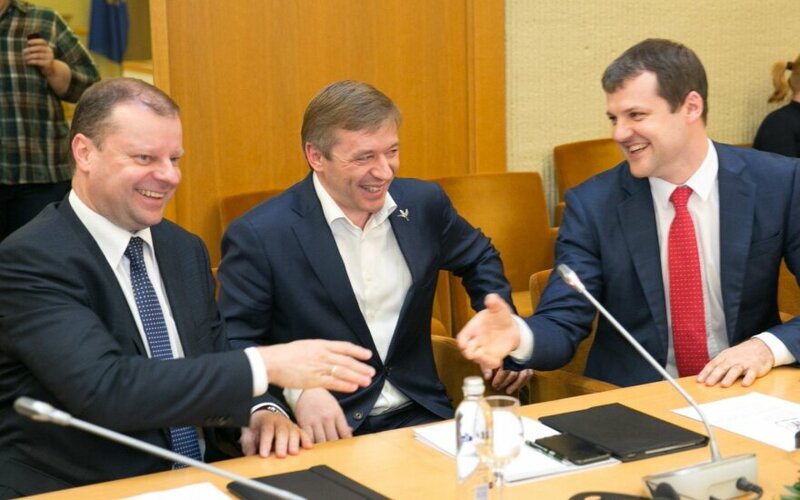 Gintautas Paluckas, the newly-elected leader of the Lithuanian Social Democratic Party (LSDP), said after Wednesday's meeting with the Lithuanian Farmers and Greens Union (LFGU) leaders that relations with the coalition partners had improved. Paluckas, Prime Minister Saulius Skvernelis and LFGU Chairman Ramūnas Karbauskis took part in a joint sitting of the two parties' political groups at the Seimas and then held a smaller-format meeting. "(The relations) obviously improved: we met. Of course, there are things that need to be discussed," the LSDP leader told reporters after the sitting. "As I have already mentioned, these are not ultimatums or radical demands, but we'd want to have that feeling of equality when we sit at the decision-making table. Today I do see that good will or the beginning of it, but we will definitely have certain priorities and will want to highlight them in the government's current program and action plan," he said. President gives no comment on Skvernelis-Paluckas "exchange of rhetoric"
Both the new Social Democratic leader and the LFGU-delegated prime minister said that regular meetings of the coalition council and joint sittings of the political parties should help the partners find common ground. The LFGU has 56 seats in the 141-member Seimas and the LSDP has 19 mandates.